The 10-year US Treasury yield hit a low of 2.04% on 7 September but ended the week higher after US' August inflation reading exceeded expectations. With central bank bond purchases expected to decrease by nearly $1 trillion in 2018 as the Fed starts to reduce its balance sheet and the European central bank moves to buy less bonds, yields are set to rise. Citi analysts expect the 10-year US Treasury yield to rise to 2.7% by June 2018. Low global bond yields and the improving economic landscape had fuelled inflows into high yield debt. While default rates are likely to remain low around 2%, valuations have become less attractive. Bond market volatility may increase as yields rise. While Citi analysts remain moderately overweight US high yields, investors can look to diversify their income sources. Citi analysts are positive on non-agency residential mortgage-backed securities as US housing prices continue to improve. 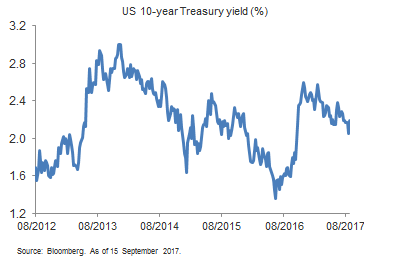 While yields have become less compelling, the sector still offers portfolio diversification and low correlation to higher US rates. Citi analysts are expecting that healthy US economic and earnings growth are also expected to be supportive of US Investment Grade corporate bonds. However rising yields could offset tightening spreads. As such, US investment grade corporate bonds may deliver less volatile, close to coupon level returns. Citi analysts also favour Emerging Market debt (EMD). Declining inflation has allowed emerging market central banks to cut rates or hike less. A weak US dollar and still accommodative developed market central bank policy is also likely to continue to fuel inflows into EMD. Currency returns however could be more subdued as EM currencies have rallied year to date and are now closer to fair value.